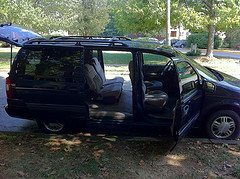 This very long and informative comment was left on an old blog post, “12 Tips for living out of your car.” There were so many useful tips, even if you don’t live in car that I wanted to post the comment for everyone to read. Thanks, Survivor Mama, for taking the time to share truly useful information with us! Having spent the better part of 5 years “adventuring”, including during graduate school at a very prestigious University, I have mastered year round hammock camping as well as living in (1) a van, and (2) a subcompact car. Vans are preferable. Honda Civics are more challenging. Having a storage place (I have a shed at a family member’s property) is also helpful. While Walmart dry camping or in a corner parking lot with a car cover are options, finding a private place to set up a mini-campground is a great addition to either vehicular living option. 1. Organize, organize, organize! Have a place for everything and keep everything in its place. In addition to your sleeping items, you will need a carry-on style suitcase for clothes, a laundry bag for clothes pending a trip to the laundry (with air freshener), a “chuck box” (your car camping kitchen supplies), water storage container and a cup/water bottle, a tool box, a briefcase organizer for paperwork, a box with your camping supplies, a toiletry case (with towel, washcloths, shampoo, soap/shower gel, hairbrush, other hygiene supplies), flashlight/LED lamp and candles. 2. Keep toiletries and a plastic mirror in a separate bag or small backpack for convenience and discretion. If you add a collapsible basin you can fill it with hot water and go into a large bathroom stall to clean up and change. Remember to keep a separate plastic bag for wet items. 3. If you find a place to set up a base camp of sorts (esp in an out of the way wooded area) you can be semipermanent. Private property will provide legal security. In this case, you can set up a tarp/hammock (super comfortable), and rig up some more homelike comforts (potty/shower stall, etc). 4. Making a mini-rocket stove and having a shelter makes cooking easier, provides a way to heat water for cleaning up (a copper coil heater in a large bucket can heat while one is cooking or making a campfire to warm up for the evening. 5. A folding, hanging shower stall and a shower bag with nozzle makes for a hot shower even in freezing cold, and one can get dry and re-dressed before even feeling cold. For a floor, a baby inflatable 1-ring mini pool makes a perfect showerpan floor and warmly cleans your feet as you shower. Otherwise, use something else to keep your feet off the ground. 6. If you really do decide to build yourself a camp, Home depot always has free 4′ wooden pallet supports that you can combine to make floor decking, a table/shower/kitchen setup, frames or bench. Lowe’s usually doesn’t keep things long enough for you to get them. 7. Water: A tarp canopy can be set up to double as a water cachement system. You can secure potable water other ways. When in a store/cafe one can also put a collapsible water container in a backpack and fill it with hot water in a restroom for use after you leave. 8. Cooking: Oatmeal, dehydrated meals, fresh vegetables, soups and small cuts of meat are easy to cook w ith just hot water and a pot. We are fortunate to have access to dollar stores for a lot of cost-effective variety and options. Note: Large reclosable Monster cans are the easiest for quickly bringing 3 cups of water to a boil, and can last weeks before giving out. 9. Always use window shades in your car for privacy. It also helps minimize some radiant cold. 10. Whenever possible, secure reasonable supplies of paper-goods. Newspaper is a good insulator (e.g., nest to the drafty door panel at night or under your sleeping bag if you are using a hammock) and super fire tinder. Cardboard box pieces can be cut into strips and coiled up into a can for a good sterno-substitution (esp if you pour melted candle wax over the coil). Even used cups can be turned into fire starters, and tissues, paper towels/ TP are multipurpose. 11. A solar charger for cell phone/computer is a real lifesaver for times when you do not have access or choose to not go to a cafe. 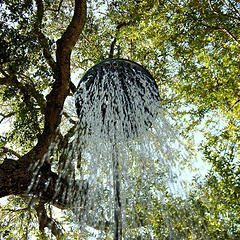 serves as a carport (and water cachement system that drains via water chain into a large bucket) . 13. 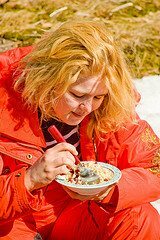 Temperature control: Staying warm and eating a warm meal morning and evening make all the difference in colder climate winters. Summer heat, on the other hand, is best handled by well ventilated sleeping, cool baths/showers, and good hydration. There are plenty of places to stay cool during the day. In very cold weather you can preheat your sleeping bag with a bottle of hot water. By the time you need a drink, it will have cooled. In warm weather, raise your tarp sides to allow more ventilation and funnel breezes. The colder it is the more you want the tarp to morph into a cocoon shape, closing ends to stop wind or blowing precipitation. Lowering the tarp sides forms an acute angle that minimizes precipitation build-up on your tarp walls (and less chance for damage by heavy rain/sleet/hail). In a blizzard or heavy snow, you will wake up surprisingly warm as you end up with a lovely insulated igloo effect with natural snow walls on the lower half (at least) of your tarp cocoon. Below your hammock will be pristine ground. In the event of torrential rain, any water will be on the ground and not in your sleeping bag as you would have with tent and ground camping. I once awoke with 12″ of water under me. My feet got wet walking out but I was well above the flash flood water line and awoke dry — just rolled up the pant legs and carried my dry shoes out with me. I keep them in a zipped homemade gear-bag that hangs on the ridge line of my tarp. When car camping, secure a car cover or tarp over you in really bad weather. In addition to insulating and giving better privacy, the covering keeps your car snow/ice free and prepped for rapid travel if needed. 14. Sleeping Options: Keep windows open a little bit when your car is covered. While no car is actually airtight you will feel better with more air circulation, and will minimize condensation. Whenever outside, I sleep in my hammock (it has a tarp covering around it, too), otherwise, in the car with my favorite pillow and sleeping bag. I have slept in both my car and more so my hammock through hurricanes, blizzards, tornadic cells (oops, that was a surprise), 106 degree heat, and 5 degree cold plus 50 mph winds. There are different hammock/tarp configurations for as many weather patterns. I have honestly never been wet or cold. Sometimes it has been uncomfortably warm yet bug-free thanks to the integrated no-seeum netting on my hammock. Insulate under your sleeping bag (thick newspaper or foam pad/thin air mattress) and hang a separate layer under your hammock as a waterproofer and insulator. In cooler weather, always keep woolen socks, hat (buff, beanie or balaclava) and gloves in your sleeping bag as well as thermal pants and a sweatshirt to sleep in. Never go to bed dirty. 15. Lighting: Candles have come into disfavor as a safety hazard. Presuming you are an adult, use your best judgment. For the past 20 years I have had a hanging candle lantern with an added rear reflector that I adore. It adds safety and light…The melted wax is added to coiled cardboard in pop cans for quick fire starters. Energy efficient LED lights are an excellent and inexpensive option to candles. For people choosing to park in a Walmart or other lot, you will generally be trying to KEEP OUT the light at night. Why the alternative lifestyle? I have been homeless for financial reasons in the past and came to learn that I actually enjoy self-sufficiency. I get excited when the hardware store gives me 100 8′ 2x4s they were going to throw out, and I use them to make things for my “retreat”. I recently built a wooden deck floor and fire reflector short wall, a bench, and a separate full shower stall/potty/changing room (wood framed with tarp walls and tented top secured to a tree branch) next to my tarp shelter and ‘carport’ area. I am an otherwise mainstream healthcare professional. No one associated with work knows how or where I live. Divorced from my ex-husband, my money ultimately gets invested in my now-adult children. They seem to have many more needs than I. Once in a while, when I can get a great deal (less than 50% rate) on a discounting site for my favorite hotel, I treat myself to a few days of a king sized bed, thermostatic heat, hot water on demand, free breakfast buffet and all the other accouterments. That is when I do the extra things like deep condition my hair, do my nails, iron my lab coats and dress shirts, work out until I am a sweaty mess 🙂 then go shower and do my hair, etc. It is important that people who live in their vehicles stay organized, maintain excellent hygiene, and maintain a positive attitude. Appreciating what we have is a great blessing. Interesting. I would probably try this if I was single and childless. I loved the original article. So thank you for posting this great story. Will share with my Survival for Blonde folks. And archive on a few Pinterest boards. If we don’t have a bug-out location, we all need to be ready to do this. Kudos!! I saw this on Dual Survival, and then had a chance to try it out. You know the silver, mylar space blankets that are the bane of, but required for, preppers? Well, if you open it up, then use the blanket as a reflector from the fire, you will be incredibly warm! Put the silver blanket behind you, but reflecting the fire/heat source-we strung ours up like a tarp and even with camping in the cold mountains, we were amazingly cozy. I have car camped-it is far easier in a large van than a car. Be sure to park somewhere safe:we had to move 3 times to avoid weird kooky-lous and creeps. It can be dangerous. These tips were so great-thank you!! The mylar blankets are fragile and dangerous. Invest about $15 and get a real quilted Space Blanket with grommets in the corners. This will last a long time and you can use it more than once. This is a great article many helpful tips and advice. Thank you for sharing! Loved this! I was afraid that I was not going to get a hotel room last summer while travelling with my daughter and then thought, well, we have a van and we can sleep in it if we have to. Thanks for all the tips on this. Would like to see some pics of how you set up your hammock and tent shelters though…… best of luck to you. I have found a neat website on living in a van or car. He has an ebook out but most of the info is on the site: http://cheaprvliving.com/index.html He gets very specific on how to stealth camp/camp on public land and how to arrange your vehicle for maximum comfort. There’s more to this lifestyle than discussed. How do you deal with nosy LEO? All you need is to get taken in and your vehicle impounded where it will get stripped of anything of value at the tow yard. What about security? Do you string some fishing line around your camp at night and have it hooked to some bells or something? Do you have a gun? Baseball bat? Knife? Slingshot? Bow? Air horn? IMHO, it’s not a lifestyle that’s enviable. There’s a reason most of us live in solid buildings. But something you might have to do once or more in your life. I have a brother who is an ex druggy. He has told me a little about the homeless. He says if they get the chance, they will loot anything and everything you have. We shared this on our Facebook page. Thanks! Wow, very interesting that someone would choose this lifestyle. Kudos. I have a question about keeping food items in your vehicle either because it’s your primary residence or stocked as a bug out vehicle. Since it can get pretty hot inside a car and any food storage recomendations suggest cooler temps, what would be the best foods to keep? Little to no prep needed and can take being stored in hotter temps? Stopped by to get some information. Right now I’m planning to move to another city (Midland, TX) to look for a better paying job but the rent is much higher. I don’t get it. You say that your adult children needs come before your own comfort and safety. I love my children but if I was a single person there is no way I would live like this. I hope one day your children invite you to live with them. I’m starting my second night homeless with car in the Kansas winter. Homelessness was always my greatest fear but I’m getting excited by the freedom of it. You’ll be in my thoughts and prayers, Alan, as you journey through this next, hopefully short, chapter in your life. Stay warm! To the one who made the comment about solid walls being better e.g. a house, perhaps you haven’t noticed they also have large glass areas called windows, not very secure either, a sheet of contact over that, a tap with something hard & they are coming in without much noise. I would have hoped survivalists were aware that a modern house is not secure. At least the vehicle can move to another location unlike the house. This article is outstanding. For those who tend to categorize and stigmatize the homeless, here is an example of a professional whose IQ is probably twice mine and yours. Sounds like she might be a scientist. Maybe she travels to exotic places like Antarctica, and living this way prepares her for the expedition. Let’s refrain from judgment. We may all have to live without the benefits most of us now take for granted. I have known homeless who had tons of money, but couldn’t stand the confinement of living indoors. One such lady had lost her children and her husband in a housefire. Personally I find this condition tragic, but who am I to judge? It is a minor point but I would like to say that once a person finds a location on private property where they can set up house as she described, although she’s sleeping in a van or on a hammock outside, I don’t consider this homelessness, strictly speaking. If in a wooded location on private property, she could be, and I hope for her sake she is, perfectly safe. On the other hand, sleeping on the street or in a parking lot is a scary and dangerous experience for most people. In a house you are much safer, with glass windows. If windows scare you, iron bars are a popular option in high crime areas along with big ferocious dogs and tiny dogs that bark every time someone is in the vicinity. I’m living in my car a second time. I lived six months in car before. Can’t/ refuse to deal with evil- hearted relatives that feel “obligated or convinced ” to take me into their big beautiful, spacious house, due more to embarrassment than genuine concern. I want to be self-sufficient; therefore I am enduring much discomfort. However, peace in not seeing negative body language or hearing hostile remarks directed towards me by family member- priceless! I appreciate the tips, I’m also unemployed, but making it. Unemployed. That’s really rough. After leaving me alcoholic ex husband and losing my place to live I’m back in my car. Although, I’d travelled and slept extensively before leaving. I’m fortunate to have income. My relatives(parents are dead) don’t even offer me a place but they’re quick to play armchair quarterback and tell me what they think I need to do or should be doing yet not one of them has ever slept one night in their car’s. You said that better than I could have, but I have endured those petty remarks and hostile vibes up until last night…….my first night in this unwanted adventure called homeless w/car. A few years ago I was making six figures for six years in a row. One year I made nearly 200k. I often walked right past homeless people without offering a dime. Yet for some reason, I always had a premonition that I’d be homeless one day. Here it is. Great tips. If you can find a place to set up a camp. I’m not sure I’d want to risk someones private property. I’d be more worried about the owner than the police.As for backpacks most stores do not allow them. Don’t know about restaurants. I can say covering your windows(unless it’s a van, they’re less noticeable especially cargo, custom vans) brings more attention to yourself than not trying to hide it all. I’ve been travelling and living in my car off and on for a few years and I can say I got noticed way more trying to cover windows. It’s just too obvious. I’ve gotten used to the light but one thing I do now is hang a jacket or long sleeved shirt in the window. It helps to block out some of the light and offers a little privacy. And it doesn’t look funny or call attention to yourself.The old adage, you can hide in plain sight works better than trying to hide. I do agree with not parking in the same spot any more than oyu have to although I’ve parked in the same truck stop, walmart for days(sometimes weeks) without(fortunately) being noticed. I’ve foiund it best to park closest to the truckers because usually/hopefully the employees aren’t parked there. If they see you they will tell their boss(happened to me). I have a midsize car and I’m sure a van would better but can’t get one so my car has to suffice. The hardest thing is not getting cold.And just cant make a sleeping bag work inside a car. Some say it can but it didn’t for me.And of course there’s the food issue. There’s no way to cook inside a car. NOt sure it would be safe if I could. That leaves me having to buy preprepared foods. Subway’s my favorite although cheap alternatives can be purchased in walmart for my nightly snack.I suppose if I got really desperate I could go to soup kitchens, etc. but won’t if I Can get out of it because I don’t want anyone identifying my vehicle and possibly making me a target. In some areas that’s a big problem. Not only with police but with other homeless.I know of people who had their things stolen or cars broken into.So I avoid that. Another thing that keeps me less noticed I think is, One, I don’t stay in one town for too long and I always travel out of state.Have one runin with the cops in your hometown and you’re on their radar and my experience and talking to others is they will hassle you until you’re forced to leave town. And some areas homelessness and sleeping in cars is illegal. I personally use an address on my drivers license that is far away from where I call home so when I am in the area it looks like I’ve travelled from 400 miles away. It’s an actual address, just not mine. DMV told me to use a family members or friends address. And that’s something else, cops cancheck if it’s a legitimate address but not if you actually live there and when you’re 200 miles away all they can do is verify it exists. It’s out of their jurisdiction and too time consuming for them to do anything else.